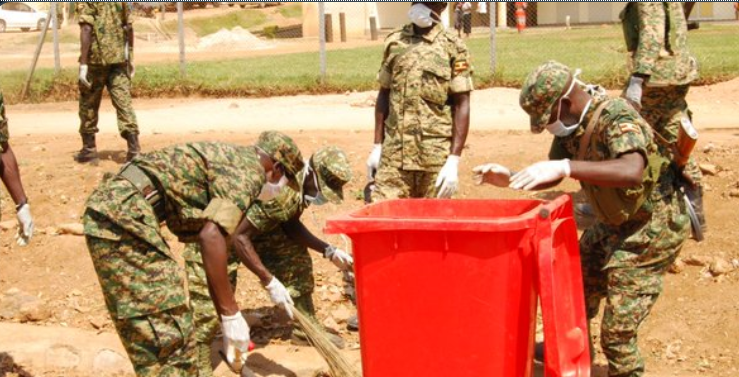 UPDF soldiers engage in a Mbarara city clean -up and makeover ahead of the Terehe Sita celebration. MBARARA – The Second Division commander, Brig Kayanja Muhanga, asked Ugandans to support Uganda People’s Defence Forces (UPDF) in its endeavour to maintain peace and security in the country. Brig. Muhanga was leading soldiers in a cleanup exercise in Koranorya market and Mbarara regional Referral hospital on Monday as part of the activities to mark Tarehe Sita. “UPDF cannot be there without people and that is the difference we have from army of previous regimes. UPDF has ensured security all over the country and now we are giving back to the people because we are peoples’ army,” he said. Mbarara Regional Referral Hospital Director Dr Celestin Barigye thanked the army for the support. Tarehe Sita, which means the sixth day of the month in Kiswahili, is celebrated annually in Uganda in commemoration of February 6, 1981. Tareh Sita celebration is a very significant event in Uganda. Celebrations to mark the 38th Tarehe Sita anniversary will be held Wednesday 6th February at Kitgum Core primary teachers college grounds in Acholi sub-region. The anniversary will be held under the theme “UPDF and the people: Consolidating peace for sustainable development and prosperity”.